Lamb chops thaw best when brought down in temperature in a controlled manner, such as cold-water submersion or refrigerator-defrosting. Defrosting at room temperature is unadvised unless the lamb is submerged in water, which effectively protects it from oxidation, airborne pathogens and bacteria. Thaw lamb chops in their original packaging if possible, but never thaw them unwrapped, as direct contact with air or water has a negative effect on the meat’s texture. Cook lamb chops thawed using the cold-water method if you intend on refreezing them. Remove the lamb chops from the freezer and set them aside. Line a shallow baking dish with paper towels. 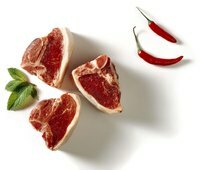 Position the lamb chops on the paper towels and place them on the bottom shelf of the refrigerator to defrost. Allow the chops to thaw for four to six hours, depending on their size. Change out the paper towels as needed while defrosting. Remove the lamb chops from the freezer and place them in a food-storage container approximately twice their size by volume. There should be enough space in the container to cover the lamb with a minimum of 2 inches of water. Cover the chops with at least 2 inches of cold water. Place a plate on the lamb, if necessary, to keep it submerged. Allow one to two hours of thawing, depending on the size of the chops.